Aeralis (Frost #5) is coming along well, so yay for that. I'm getting close to halfway done with the first draft. I am hoping for an August release at this point. We'll see!! I know you lovelies are impatient to read it, and that warms my heart. It also motivates me to work harder/faster. It also makes me want to reassure you! So just so know you, I am working on it. I wrote a post over at the group blog I share with some other writer folk about the pros and cons of writing a series. You can read it here. Annnnnnd I am just finishing a ten thousand word novelette set in the Frost world (but featuring some new characters) that I wrote for a short story collection I'm doing with a couple of other authors. I'll let you know more about that and when it will be available as I have details. Have a wonderful Memorial Day, those who are American/celebrating, and the rest of you, have a wonderful Monday! I love that quote. That's what I'm doing these days...going after that inspiration. And sometimes I seriously feel like the inspiration is fighting back. Drafting a novel can be pretty emotionally exhausting. You're creating a world from scratch, and you're conjuring up all these emotions along with the characters, and you're grinding out a lot of things that feel mundane at the moment (but will work well once everything has been edited and polished). It can be intense work, and some days I'm utterly spent when I finish working. Right now I'm staying motivated by rewarding myself with episodes of my favorite TV shows when I finish my word count for the day. It's keeping me on schedule. On a more cheerful note, I'm about 1/3 of the way through the first draft of Aeralis. Woohoo! I'm still hoping for a late July/early August release date, but I can't promise that. These things have a way of taking more time than I expect. But hopefully! Teaser: Earlier today I finished writing a sad scene (well, it made me sad) between Lia and a male character who will remain unnamed. You'll have to speculate who it is, and what "sad scene" means, because it could mean just about ANYTHING. Muhahaha. 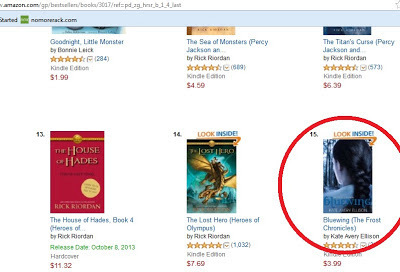 Right now Bluewing is hanging out on a few Amazon bestseller lists, including "Fantasy and Magic." 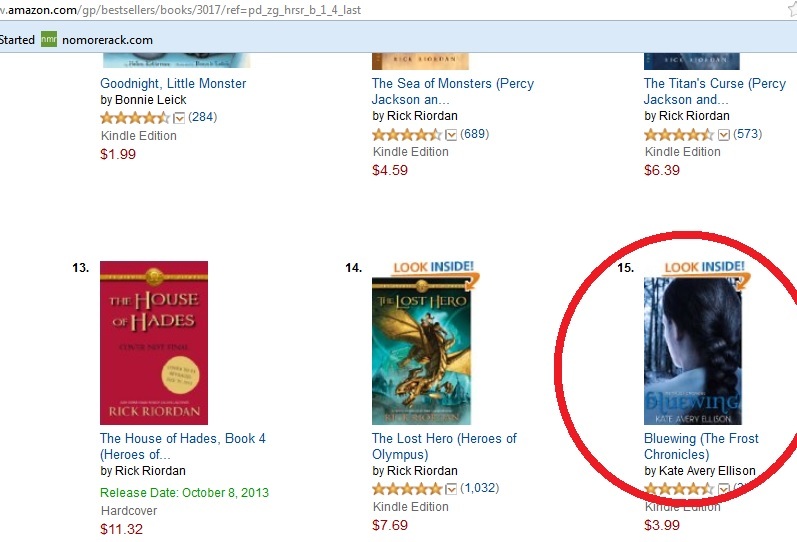 Here it is keeping a bunch of Rick Riordan (The Lightning Thief) books company. Aw, they're neighbors. How cute. Thank you all for reading my books. I appreciate my readers very much!!! Also, PS ~ I've finished my writing vacation and I'm back at work on Aeralis. I think (hope!!) you guys are going to really like this one. Lots of exciting stuff is going down. :) I can't wait to share it with you all. I'm also working concurrently on a companion novella from Ann's perspective that will cover the events of several books, but I'm not sure when that will be released. Originally I thought it would come out before Aeralis, but now it might contain some spoilers for book 5, so it might release after that one comes out. We'll see. I'm not sure yet. I really enjoy writing about Ann--she's very different than Lia, and it's fun to get to be in her head for a bit. I also wanted to say how much I love the comments and tweets and messages and emails I get from you guys regarding the books and the characters and how much you can't wait for the next book. I read everything you say, and your enthusiasm carries me through each grueling rough draft. Thank you for reading my books. I write them for you.